The Church of Scientology International (“CSI”) has often been accused of pulling out all the stops to suppress speech critical of the organization. Surprisingly, however, they have not yet made it into the EFF Takedown Hall of Shame. Until now. Last week, CSI demanded that GoDaddy take down a website, cheerupwillsmith.com, that used parody and satire to tweak CSI, its alleged relationship to actor Will Smith, and its reportedly aggressive control over the activities of its members. 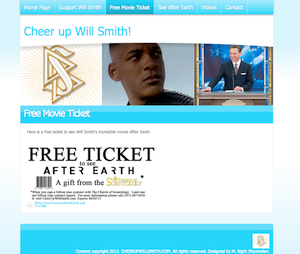 The site included a letter, purportedly from Scientology leader David Miscavige, ordering CSI members to see After Earth, a new movie starring Will Smith that hasn’t done well at the box office, at least three times. The site also demanded that CSI members make videos supporting Smith. Pointing to the presence of CSI logos and a photograph of Mr. Miscavige on the site, CSI told GoDaddy the site violated CSI’s copyright and trademark rights, and asked the company to take it down. GoDaddy promptly complied. CSI also claimed that the creators of the site had violated California Penal Code section 528.5, which forbids the credible impersonation of a human person online. Section 528.5 was intended to be used to combat cyberbullying; as we anticipated, however, it’s now being used to target political speech. As we explained in a letter to CSI, however, none of these claims holds water. With respect to the copyright allegations, the noncommercial site was obviously designed for purposes of criticism and comment. It used no more than was necessary for its purpose, and caused no conceivable harm to any market for CSI works. In other words, it's precisely the kind of speech the fair use doctrine is intended to protect. The trademark allegations are equally silly. The website simply uses parody and satire to comment on CSI, its reputation for controlling its members, and its alleged relationship to Will Smith, star of the film “After Earth.” That kind of speech is protected by a variety of legal doctrines, not to mention the First Amendment. Finally, the claim that the site violated the California Penal Code is equally absurd. Section 528.5 applies only to “credible” impersonations. No viewer would think the site offered a credible impersonation of Mr. Miscavige—but perhaps CSI knows something we don’t? Given the outrageousness of CSI complaint, it’s shocking that GoDaddy would respond without hesitation. Activists of all kinds should take heed and look for service providers with backbone. In the meantime, congratulations to CSI: you made it to the Hall of Shame at last.